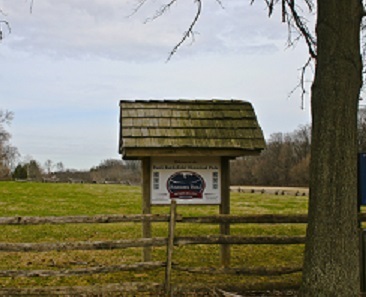 NHL Status Update - July 2016 - Paoli Battlefield Preservation Fund Inc. Since our last update in February a number of important actions have taken place which have expanded our documentation and research and moved us closer to achieving our goals. These steps highlight cooperation between PBPF and government historic preservation agencies on the County, State and Federal levels. And they all hinge on the research that has been developed since the Paoli Battlefield Historical Park was established. Please check our site regularly as we will keep this page updated on our latest status. In March we submitted a 27 page draft Statement of Significance to the NHL staff in Washington providing voluminous documentation and analysis supporting the unique importance of the Paoli Massacre. To achieve NHL status a site has to have a national level of significance of “exceptional value and quality in illustrating or interpreting the heritage of the United States.” We have received verbal notification that our documentation supports being considered for NHL status and we need not to submit further documentation. Our next task is to edit our draft statement into a very focused statement of significance for consideration by upcoming NHL review boards comprised of outside experts (noted historians and other subject matter experts). The NHL process calls for two separate Outside Expert review boards. This is a time-consuming process and our 2-year American Battlefields Protection Program (ABPP) grant officially ends on August 1, 2016. We therefore requested that our grant period be extended for one year. ABPP approved the time extension but it does not include any increase in the dollar amount of the grant. We will continue to wisely manage our expenditures. What is the exceptional national significance of the Paoli Battlefield Site and Parade Grounds? British atrocities outraged our young nation’s soldiers and citizens, resulting in the battle being called the Paoli Massacre and creating America’s first battle cry, Remember Paoli. It started as a call for revenge (acted on during the Battle of Germantown). But it gained an additional dimension as the Continental Army became a trained fighting force at Valley Forge and Washington successfully attacked the British at Monmouth NJ as they withdrew from Philadelphia. Remember Paoli became a rallying cry stating that Americans might suffer setbacks but they would persevere and overcome. The fledgling nation was trying to understand what made it different from their colonial masters. Our nation was forged in the crucible of war and Remember Paoli served as a catalyst to describe the American warrior, touching deep-seated ideals, shared values and patterns that had defined our national identity along military traditions since the arrival of the earliest settlers. Remember Paoli became a symbol of British barbarity and American resilience. You have established the national character of our country. You have taught our enemies that bravery, humanity and magnanimity are the virtues of the Americans. Remember Paoli became part of our national memory both during the Revolutionary War and far after it ended. It revealed our character as having the values of Perseverance, Resilience, and Righteousness. In the 150 years following the battle, the Paoli Massacre and Remember Paoli were as well-known in the U.S. as Remember the Alamo is now. They became part of the national lexicon and often cited by politicians, newspapers, veterans and patriotic groups throughout the years and all across the continental United States. It faded from memory in the last century but also became the uniquely American template for future battle cries from the War of 1812 (Remember the Raison), Texas Independence (Remember the Alamo), the Spanish-American War (Remember the Maine), World War One (Remember the Lusitania), World War Two (Remember Pearl Harbor) and the War on Terror (Remember 9-11). Amending the National Register of Historic Places (NRHP) in our in-depth research and documentation on the Battle of Paoli and Memorial Grounds, we verified that both the military battle and it’s commemorative aftermath had many more unique features and factors than were recorded in the initial application approved in 1997. That application was also approved at only a local level of significance and not a state or national level. This was done for expediency as the 40 acres was up for sale and delay over the level of significance would have been counterproductive. Now we also realized that if we establish national significance in these other areas it would enhance our chances to become an NHL. Therefore, we decided to amend the current National Register of Historic Places information. The National Register is official record of the any historic site in the nation. Documentation submitted through the ABPP or the NHL augments but does not update the official record. One other thing we realized (in conjunction with our Chester County Planning Commission partner and the Pennsylvania Museum and Historical Commission’s Historic Preservation Office: PHMC-HPO) is that the entire Philadelphia Campaign of 1777-1778 had not been identified as a nationally significant event, even though many places involved in that Campaign (Brandywine, Germantown, Valley Forges, etc.) are NHL’s. There is a specific process in the National Park Service to create a geographically large historical area, called a thematic or historical context area. It would be advantageous for our research and amendment to our NRHP record to establish the Philadelphia Campaign’s national significance. This task would normally be the subject of a separate and time-consuming grant request but funding is limited. We went back to the ABPP and got their enthusiastic approval to expand our research and reporting. All NRHP applications and amendments must first gain state approval so PHMC assigned one of its 3 reviewers to help expedite our amendment request including our Philadelphia Campaign segment. Our current timeline should allow PHMC review and recommendation in time for the next NHL Review Board. This would finally remove the “local significance” stigma as well as confirm the national level of significance in several categories. We are on-track with our NRHP documentation and, using the same editorial techniques being used to perfect our NHL submission, we should have professional level submissions within our projected time frames. Donations and Sponsorships for Matching Funds ARE NEEDED! Help us in this once in a lifetime opportunity!! We are a registered 501C(3) and all donations are tax deductible to the fullest extent of the law. To make a donation, click on the link on the top right part of the screen under Please Donate. PA Educational Improvement Tax Credit are being set up to develop extra-curriculum programs in K-12 schools to participate in living history, field visits and participation in preservation and research activities related to the Battle of Paoli, the Revolutionary War, Veterans and our national heritage. Businesses are encouraged to contact PBPF – Contributions to this program can be used as tax credits rather than just charitable donations.